I want to use some black white and either pink or orange linen yarn that I have and weave up a bit of lovely plaid, but I can't decide what permutation I like. I asked around on twitter/facebook and got a different answer from everyone who replied. Ha! The only thing left to try is a poll. Help me be decisive, my loom is calling to me. In a previous tutorial, I have covered making colorwork charts in Excel. Excel is a wonderful option for simple charts because most people have access to and a comfort level with it or to a similar opensource alternative. However, for the persnickety designer, Excel lacks a certain level of precision and flexibility. Illustrator has a steeper learning curve but gives you unlimited freedom in designing your charts and many more options for file formats. For this tutorial, I'm experimenting with doing videos instead of my usual written out method. I would love your feedback on which you prefer. You'll have to excuse my crummy editing, I'm still finding my way around iMovie. I'm embedding the tutorials below, but I think you'll find them easier to view in High Quality [HQ] and in full screen, so you may want to watch the videos over in YouTube by clicking these links: Part I, Part II, Part III. If there's a good response to these video tutorials, I'll continue to create them, otherwise, I can go back to my old method. There are oodles of ways to create charts. This is one way, not necessarily the right or best way. Play around with the tools you have and adjust as you see fit. I love hearing your ideas. If you have suggestions, leave them in the comments. Download the Illustrator file here. Note: I've converted this file to be compatible with Illustrator 10 and higher. I lived most of my life in New Hampshire and Massachusetts, experiencing the full range of seasonal changes from hot and muggy to sub zero, covered in ice, I think my eyes just froze shut cold. But it wasn't until I moved to Los Angeles that I suddenly rediscovered knitting and took to it in earnest. Five years in a climate that rarely dips below 55 degrees Fahrenheit and often blasts right past 90, gave me a keen appreciation for versatile and light knits. As any of you living in warmer climates know, balancing comfort in the hottest temperatures with the over zealous application of climate control in various offices, restaurants, theaters and stores, is not as easy as one might assume. Enter Kristi Porter's newest book, Knitting In The Sun. This collection of 32 projects is sure to please almost anyone who lives somewhere with at least a few months of warm weather. For my stop on Kristi's blog tour, I'm doing a brief interview with several of the contributing designers from the book. A huge thank you to the following designers for their contribution (in alphabetical order). I think you'll all agree that their answers are really interesting and their designs are simply lovely. Most images Copyright Wiley Publication, all rights reserved. One image copyright Julia Trice, all rights reserved. Continue reading Knitting in the Sun Blog Tour. 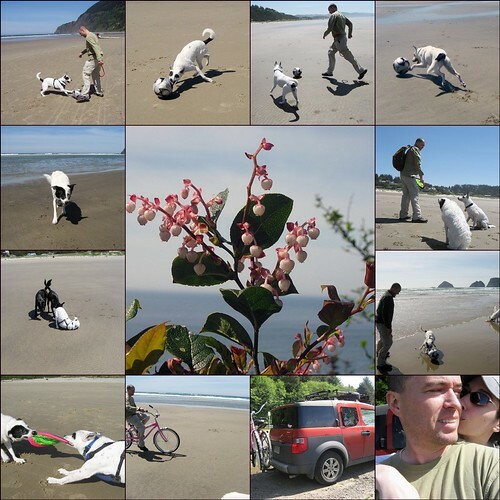 All day at the Oregon coast. It couldn't have been more beautiful, mild and lovely. We played soccer and fetch with the pups then pulled out our bikes and ran them until they seemed to be almost something resembling tired. The soccer ball is now Thea's passion. It irks her to no end that she can't get her mouth around it and still she can't stop chasing it. Panda can't be bothered, it's the squirrel all the way. Any other Wallace and Gromit fans out there? And if so, did you know that Shaun has spun off his own series? 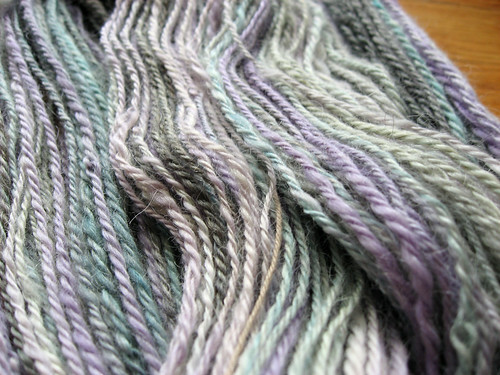 4 ounces of Spunky Eclectic Wennsleydale Longwool in colorway, Perfect Storm. That's right, Wennsleydale, as in Wallace's favo[u]rite cheese and the one thing that keeps him from true love. I get it, Wallace: cheese is full of the awesome. This fiber was a gift from my dear friend, Julia, and it's my first interaction with Wennsleydale Longwool. Wow, what a delight to spin. It's a little courser than the types of wools I usually choose but not unpleasantly so. It'd certainly make for a great layering piece and it's a dream to spin. I spun it semi-worsted, but man alive does it have some loft going for it. I bet this stuff would keep you mighty warm in the winter. This is about 170 yards of 3-ply using a chain ply method to maintain the color shifts. After washing, this poofed up to nearly a worsted weight. But this is only my most recently finished yarn. 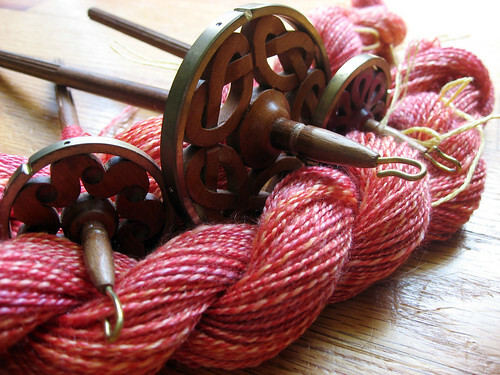 I also spindle spun another 130 yards of the merino blend, I posted about before. 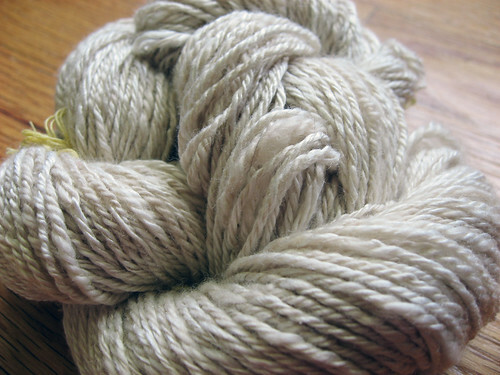 And I spun 2 ounces and 150 yards of Mongolian Cashmere/Silk in a three ply as well. Let me tell you, silk is soft, cashmere is softer, but the two are just naughty when combined. I don't think there's another word to describe how soft they are. It's a warm glassy smoothness with a bit of sheen. Heavenly. 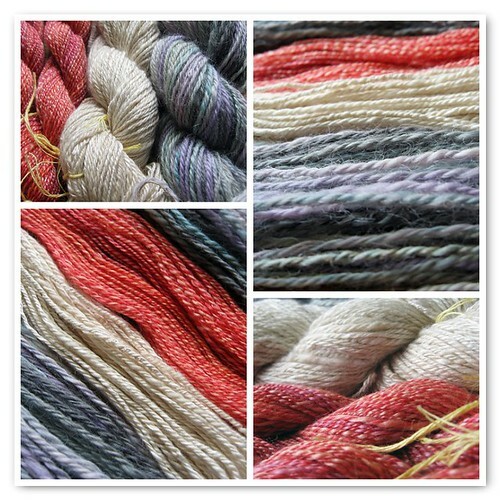 And just because I can, more of all three yarns.